Junior Bailey Greenberg posted a career-high 22 points as the Drexel University women’s basketball team won the TD Bank Classic title in Burlington, Vermont. The Dragons dispatched the Siena College Saints Nov. 23, 51-39, then defeated the University of Vermont Catamounts Nov. 24, 60-44, to capture the title. 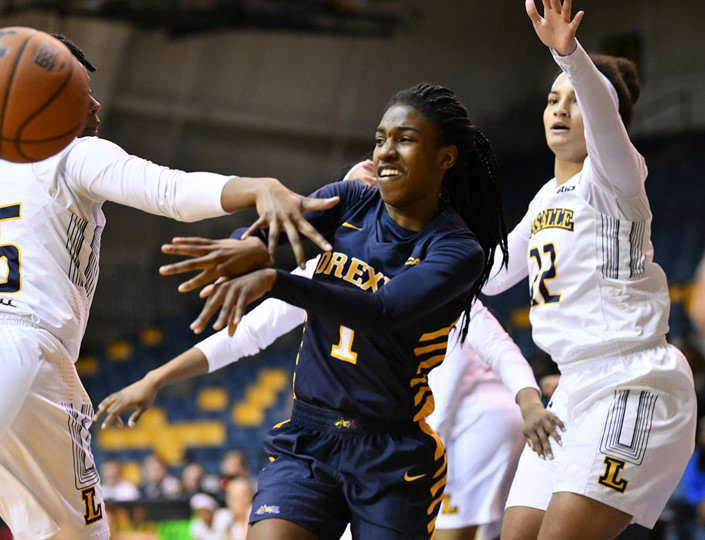 Drexel also defeated the La Salle University Explorers Nov. 28, 58-43. The team has now won five straight, bringing their record to 5-1 on the season. Against the Saints, the Dragons played strong defense to advance to the final. Freshman Keishana Washington and junior Aubree Brown drained triples to give Drexel the early 8-4 lead. Layups by Greenberg and junior Ana Ferariu made it 14-8 going into the second quarter. Siena cut the lead to one with a three-pointer from freshman Margo Peterson and a fastbreak score by redshirt senior Joella Gibson. The Saints would knot the game up at 20 on another three-pointer by freshman Amari Anthony. Senior Eline Maesschalck would give the Dragons back the lead, and Greenberg would add a free throw to make it 23-20 heading into halftime. In the third quarter, the Dragons widened their lead but the Saints stuck around. Siena got within one point again when junior Maddie Sims got a bucket to make it 25-24. However, Drexel would go on an 8-0 run, highlighted by a pair of threes from Brown and Greenberg, to make it 33-24. Drexel increased its lead to 10 in the fourth quarter on a jumper from freshman Kate Connolly. The Saints would get the deficit back down to seven on a three from junior Sabrina Piper, but five straight points by Greenberg put the Dragons up for good. Greenberg led the game with 19 points while shooting 7-14 from the field. Brown posted 12 points and eight assists for the Dragons. Gibson led Siena with 12 points on 5-9 shooting. In the championship game, Drexel used a 25-0 run to capture the title. During the first half, Greenberg gave the Dragons the early advantage. Her 10 first-quarter points gave the team a 16-14 lead going into the second quarter. Vermont stuck around thanks to strong play by sophomore Josie Larkins. Her six points in the second cut the Dragons’ lead to two, with 3:31 to play in the half. From there on Drexel dominated, going on an 11-0 run to close out the half. Washington was instrumental to the run, posting four points, two assists and a steal. Drexel carried over the momentum into the second half as they kept the run alive. Junior Niki Metzel hit a jumper to open scoring for the half, followed by a layup and three from Greenberg. Metzel added another four points, then sophomore Mariah Leonard added three points to give Drexel the 49-22 lead. The Catamounts were held scoreless for over 11 minutes as the Dragons scored 25 unanswered points. Drexel currently ranks first in the National Collegiate Athletics Association in scoring defense, surrendering an average of only 43.0 points a game. The Vermont comeback attempt was lead by junior Hannah Crymble, but would ultimately fall short. Crymble posted 12 points in the second half, cutting the Drexel lead to 13, but two buckets by Leonard, both assisted by Washington, would put the game on ice. Turnovers were a key for the Dragons. Drexel forced 19 Vermont turnovers, with 14 coming in the first half alone while giving the ball up only nine times overall. Drexel’s defense was also great again, especially from the three-point line. Vermont made just one three-pointer all day, shooting a miserable 1 of 14 from three. Crymble led the game with 23 points for the Catamounts. Greenberg posted 22 points for the Dragons along with eight rebounds and two steals. For her strong efforts in both games, she was named Most Valuable Player of the tournament and was named Colonial Athletic Association Player of the Week. Brown was also named to the All-Tournament Team after her strong performance over the weekend. Getting back into action against the winless Explorers, the Dragons kept up the quality play, leading the game from start to finish. Drexel took the early lead due to a 7-0 run to start the game. Greenberg kicked off the scoring with a layup and jumper, followed by a jumper from Metzel then a free throw by Ferariu. Sophomore Hannah Nihill drained a triple, then Brown scored five straight points to end the quarter with Drexel leading 18-9. A three by Washington, assisted by Nihill, put the Dragons ahead 26-15 in the second quarter. La Salle responded with a run to cut the lead to five, but two buckets by Metzel gave Drexel the 30-23 lead going into halftime. Neither team could generate much offensively coming out of the break. In the third quarter, La Salle and Drexel combined for just 13 total points, with Drexel taking a 10-point lead into the fourth quarter. Brown and Greenberg played strongly in the final period to seal the win for Drexel. The duo combined for 16 of Drexel’s 20 points in the quarter, with Greenberg having 10 herself. Drexel shot well from the field scoring 40.7 percent of shots. La Salle on the other hand made 34.6 percent. The Dragons also took advantage on free throws, going 8-9 from the stripe. Greenberg led the Dragons in scoring again with 19 points and nine rebounds. Washington followed with a career-high 14 points on 6-11 from the field, while Metzel led the game with a career-high 10 rebounds. For the Explorers, senior Jeryn Reese led with seven points. The Dragons will participate in another tourney next week, the Manhattan College Holiday Tournament in Riverdale, New York. Drexel will take on the Manhattan College Jaspers Dec. 7 at 7 p.m., then the Wright State University Raiders Dec. 8 at 3:30 p.m.